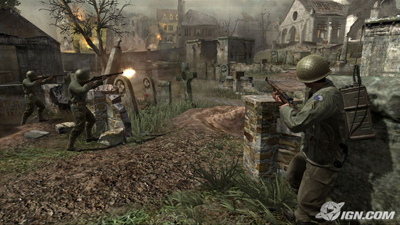 Call of Duty 3 was released in November 2006 on PlayStation 2, Xbox, Xbox 360, PlayStation 3 and the Wii. This was a tough project. Probably the hardest development cycle I've been through yet. We had to ship this game in 8 months, and we had to do it on current gen (PlayStation 2, Xbox) and next gen (Xbox 360, PlayStation 3 and Wii). We were very excited to get our shot at a fully-fledged CoD game, considering the team had worked on spin-offs or expansion packs in the past. The game had some problems, but I'm very proud of the team and myself for doing what we did in such a short time and under such pressure. Every level shown is a product of the whole team, with many assets being designed and implemented by other departments such as art, fx, sound, etc. 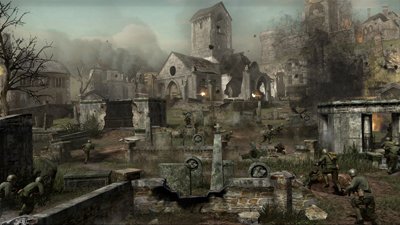 These are the levels that I worked on to some extent on Call of Duty 3. We had to make this level look and play good on "next gen" (Xbox 360, PlayStation 3, Wii) and "current gen" (Playstation 2, Xbox). The technical hurdles that came with that were huge and there were a lot of late nights. The level prototyped lots of different features from procedural grass, to retreating AI, to a simple destructible geometry system and even simulated cloth physics that I believe was cut for performance reasons. In the end, we made a level we could be proud of. 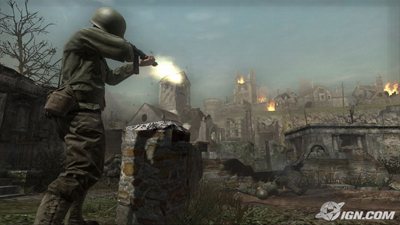 Saint Lo was used to green-light Call of Duty 3, and was later shown behind closed doors at E3. I worked on the level from paper design to completion. When the game shipped, a 2nd disc was included in certain editions that had a developer interview with Jesse Snyder, Jeremy Luyties and myself, where we talked about how Saint Lo was designed and the trials we went through to complete it. The Island was a really big level. It was the next mission in the single player campaign, after Saint Lo. It was so big, actually, that I was brought on for a little while to help flesh out a few areas and do some environment detailing. My overall contribution to this was pretty small. Mostly taking some rough, first pass buildings and doing a pass of cover and environment detailing. Specific screenshots are hard to find. So until then, all I have is a video. A small, mirrored multiplayer map that shipped with Call of Duty 3. 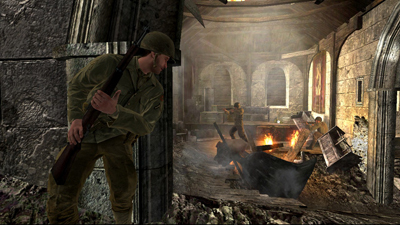 The game play took place inside and around a bunker system that sat on the side of a road. This map was best played in Capture the Flag and Team Deathmatch, and was made for small matches where you could really have dueling your enemy by firing and displacing. I worked on this map from paper design to completion. I love the title of this video. You be the judge! 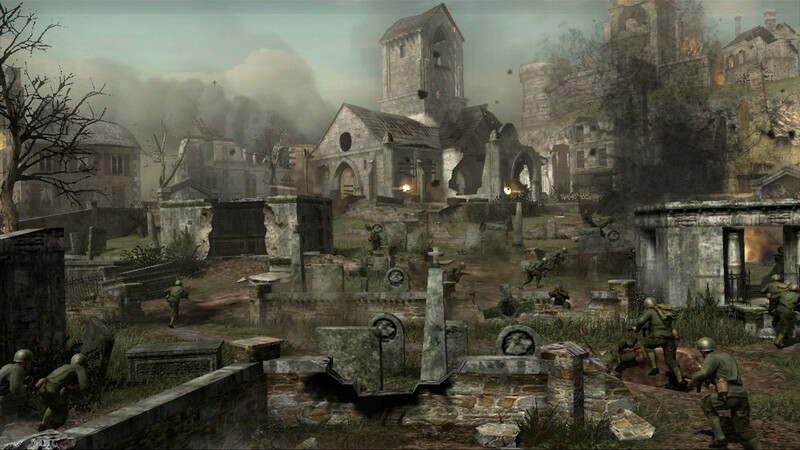 Ironclad was a multiplayer map that shipped in the first DLC pack for Call of Duty 3, the Valor Map Pack. Set in a large dry dock, it was best for linear type game modes like Capture the Flag and War. Some set pieces included some giant ships being constructed in the docks and a train wreck in the center. I couldn't find any videos of MP Ironclad, which saddens me as I think my chances to ever see it again may be gone forever. If you have something, please send it my way! 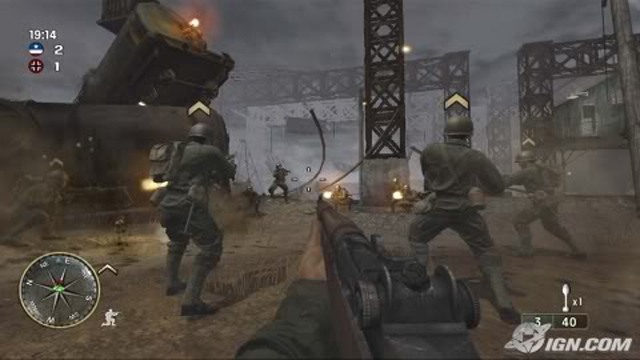 This screenshot shows the general vibe of the level. Thanks IGN!